Just outside the Angeles National Forest, located between Burbank and Pasadena, is Glendale, the third-largest city in LA County. The northern part of the city is known for its suburban feel, complete with tree-lined streets, LA hillside views, unique housing options and North Glendale apartments close to neighborhood shopping and dining favorites. 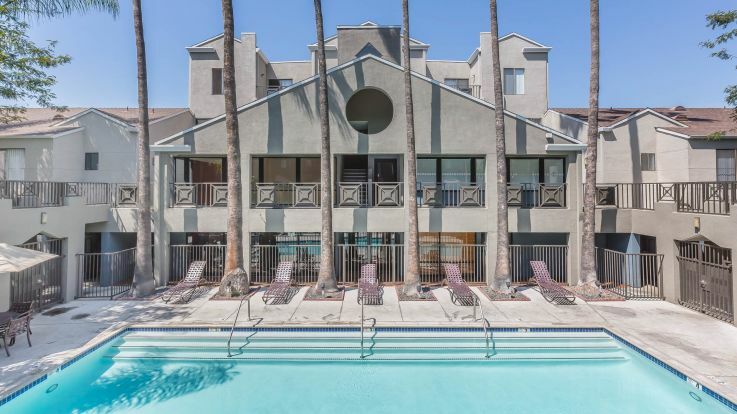 Thanks to North Glendale’s central LA County location and proximity to neighboring Southern California cities, the area is a quiet, convenient and desirable place to call home. North Glendale’s natural landscape is dominated by the Verdugo Mountains and San Gabriel Mountains, a rugged playground for adventure-seekers and nature-lovers alike. With scattered walking paths, hiking trails and biking opportunities, these natural wonders are a short drive from North Glendale apartments and provide a stark contrast to Glendale’s more modern amenities and sleek businesses. The Greater Glendale area is known for having more than 6 million square feet of office space and as the site of several major companies’ headquarters, so for many residents, commuting to work is a breeze. Glendale prides itself on offering commuters plenty of transit options, whether they take the Glendale Beeline across town from North Glendale apartments or drive in on the nearby I-5, SR-2, ST-134 or the 210. Burbank’s Bob Hope Airport and Los Angeles International Airport are just minutes away, as well, so getting out of town for work or play has never been easier. After a long day at the office, there is no better place to grab dinner and a show than downtown Glendale, and restaurants with cuisine from around the world are conveniently scattered along Brand Boulevard and Central Avenue, just a short Beeline trip or drive from North Glendale apartments. Head over to local favorite Katsuya for dinner, a Japanese hotspot that’s perfect for people-watching, or to Bourbon Steak in Glendale’s Americana mall, a top chef-run chophouse with a modern take on meat and potatoes. Follow the local fare up with an award-winning cupcake from Sprinkles (or the cupcake ATM, if you’re in a hurry) and a live performance at the historic Alex Theatre. No matter what you decide to do in Glendale, adventure and entertainment awaits!